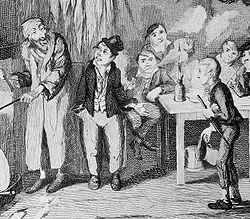 In Charles Dickens' 19th century story Oliver Twist, Fagin (far left) is a fence who recruits homeless boys and trains them as pickpockets. A fence, also known as a receiver, mover, or moving man, is an individual who knowingly buys stolen goods in order to later resell them for profit. The fence acts as a middleman between thieves and the eventual buyers of stolen goods who may not be aware that the goods are stolen. As a verb, the word describes the behaviour of the thief in the transaction: The burglar fenced the stolen radio. This sense of the term came from thieves' slang, first attested c. 1700, from the notion of such transactions providing a defence against being caught. The term remains in common use in all major dialects of modern English, all of which spell it with a "c" even though the source word in some dialects (particularly American English) is now spelled defense. The fence is able to make a profit with stolen merchandise because he/she is able to secretly pay thieves a very low price for "hot" goods that cannot be easily sold on the open markets. The thieves who patronize the fence are willing to accept a low profit margin in order to reduce their risks by instantly "washing their hands" of the black market loot and disassociating themselves from the criminal act that procured it. After the sale, the fence recoups their investment by disguising the stolen nature of the goods (via methods such as repackaging and altering/effacing serial numbers) and reselling the goods as near to the white market price as possible without drawing suspicion. This process often relies on a legal business (such as a pawnshop, flea market or street vendor) in order to "launder" the stolen goods by intermixing them with legally-purchased items of the same type. Fencing is illegal in all countries, but legally proving a violation of anti-fencing laws can be difficult. Car stereo thieves typically want to sell stolen items quickly. By selling to fences, they avoid the hassle and suspicion of selling directly to the final buyers. The fence is able to make a profit with stolen merchandise because he is able to pay thieves a very low price for stolen goods. Thieves agree to this because their alternatives may present a greater risk of the thief being caught. As well, selling stolen goods takes a great deal of time and effort (transaction costs), as the thief would have to try to contact a number of potential buyers and show them the merchandise. Some habitual thieves are so well known to police that if the thief were to attempt to sell any used goods, this would quickly draw the attention of law enforcement. The fence then disguises the stolen nature of the goods, if possible, so that he or she can sell them closer to the market price. Depending on the stolen item, the fence may attempt to remove, deface, or replace serial numbers on the stolen item before reselling it. In some cases, fences will transport the stolen items to a different city to sell them, because this lessens the likelihood that the items will be recognized. For some types of stolen goods, fences disassemble the good and sell the individual parts, because the sale of parts is less risky. For example, a stolen car or bicycle may be disassembled so that the parts can be sold individually. Another tactic used by some fences is to retain stolen items for some time before selling them, which lessens the likelihood that the burglary victims or police will be actively looking for the items in auctions and pawnshops. Fencing is often conducted through legal businesses. Some fences maintain a legitimate-seeming "front" through which they can sell stolen merchandise. Depending on the type of stolen merchandise a fence deals in, "front" businesses might be discount stores, used goods stores, a coin and gem store, auction house, flea market, or auto salvage yards. The degree of illicit activity in each "front" business may differ from fence to fence. While one fence's salvage yard may consist mainly of stolen auto parts, another fence's used goods store might consist mainly of legitimately purchased used goods, with the stolen merchandise acting as a minor, but profitable, sideline. The prices fences pay thieves typically depend both on norms and on legitimate market rates for the items in question. Vulnerable sellers, such as drug addicts or casual thieves, may receive less than 20% of an item's value. Higher prices, sometimes as high as 50% of an item's value in a legal market, can be commanded by a professional thief, especially one who concentrates on valuable items. At the same time, fences will often take advantage of thieves by deceiving them about the value of an individual item and the relevant market conditions. For example, a fence may falsely tell a petty thief that the market for the type of good which the thief is selling is flooded with this type of merchandise, to justify paying out a lower price. Research on fences shows that they view themselves as entrepreneurs, relying on networking with and patronage by prominent criminals to become successful in their word-of-mouth-based "wheeling and dealing". They occupy the middle ground between the criminal world (thieves, burglars and shoplifters) and the legitimate world (e.g., everyday people who purchase used goods). Some active fences go farther in their business, maintaining longstanding contacts and even teaching thieves how to practice their craft, whether by identifying specific products or by teaching them tools of the trade. There are a number of different types of fences. One way of categorizing fences is by the type of good in which they trade, such as jewels, power tools, or electronics. Another way of categorizing fences is by their level of involvement in buying and selling stolen goods; for some, fencing is an occasional "sideline" activity, while it is an economic mainstay for others. At the lowest level, a hustler or drug dealer may occasionally accept stolen goods. At the highest level would be a fence whose main criminal income comes from buying and selling stolen items. At the broadest level, two tiers of fences can be distinguished. The lower level of fences are those who directly buy stolen goods from thieves and burglars. At a higher level are the "master fences", who do not deal with street-level thieves, but only with other fences. The degree to which the purchasers of the stolen goods know or suspect that the items are stolen varies. If a purchaser buys a high-quality item for a low price, in cash, from a stranger at a bar or from the back of a van, there is a higher likelihood that the items may be stolen. On the other hand, if a purchaser buys the same high-quality item for the standard retail price from a used goods store, and obtains a proper receipt, the purchaser may reasonably believe that the item is not stolen (even if, in fact, it is a stolen item). The fence, or receiver, is an old kind of criminal, historically attested in many countries and with deep and complex dynamics within society. Receiving was a widespread crime in Modern England and an increasingly crucial concern for the English government of that period. It involved many other kinds of activities and crimes, and it saw its peak in the early 18th century with the notorious Jonathan Wild. Receiving is intrinsically connected to theft, as receivers, by definition, buy previously stolen goods in order to make profit out of them later. When organised theft grew increasingly important in London thanks to largely supportive receivers, the establishment started to fight it off with new laws, often aimed at receivers: receiving was acknowledged as the very core of property crime. Receiving was not considered as a felony (crime) in common law until 1691, when fences became potential targets of charges as accessories to theft. This meant that in order to judge a suspected receiver, it was necessary to condemn the related thief first. Later laws further focused on receivers, especially the 1718 Transportation Act, which, together with other measures, made fences main felons and not simply accessories to other felonies. Nonetheless, it was not easy to prove that a dealer knowingly accepted stolen goods, especially without the related theft event being fully cleared out. Proceedings stored in the Old Bailey Online archive where the offence category is receiving are 5664. Of these, 1973 have a verdict category of guilty. The 1718 Transportation Act also made a felony of returning goods for a fee, revealing that by then, receiving had already been widely taken to the next stage: returning goods to their owner, for a fee, instead of selling them in the second-hand market. Thieves could act as go-betweens themselves, but go-betweens could raise some suspicions, while relying on receivers added a safety layer against effective prosecution. A victim of theft was often willing to pay in order to get his goods back, in order to spare himself further troubles and/or if the items taken had the potential to reveal unflattering details about his personal affairs. In addition to that, for many centuries, prosecution in England was entirely at the expense (of personal money, time and effort) of the prosecutor. Therefore, also considering the difficulty of actually proving receiving in courts, common people, especially shopkeepers, often preferred compounding, feeling that prosecuting was not worth it. This gave a considerable advantage to receivers. Ticket to the hanging of Jonathan Wild. In order to effectively act as go-betweens for compounding, or brokers, fences needed to personally know thieves or have ways to easily interact and bargain with them for a common benefit about compounding: nobody was in a better position to do so than thief-takers. Thief-takers grew increasingly notorious in England as a reward was introduced by the Crown for each successfully condemned criminal. Some of them, such as Anthony Dunn, publicly referred to as "pretended Thiefe-taker" in a 1707 document, used their social power as thief-takers as an advantage for receiving. Thief-takers were usually so involved with thieves and gangs of thieves that they could easily condemn them for the reward, or use this power to intimidate and command thieves to do their biddings: in exchange of clemency or protection from capture or condemnation, they could have thieves to steal under their command. Indeed, thief-takers could act as direct instigators, supporting their thieves with intelligence or offering them shelter at need (when convenient), and then act as receivers with the stolen goods. Through parallel occupations, receivers could feed their own business. Confirmation of how thief-taking and receiving were tightly connected could be seen in the career of Charles Hitchen, who was known as a thief-taker. He bought off the position of Under City Marshal through his wife's money in order to have one of the best positions amongst the thief-takers of the City. However, a vast part of his income actually came from the receiving activity related to the network of connections with London's underworld. Hitchen controlled this network through his official (that is to say, legal) position as a thief-taker. The synergy between receiving, theft and corruption, as well as official activities such as thief-taking or pawnbroking was a huge dynamic bond where each element enhanced the others in a vicious circle. The master of this powerful synergy of London underworld was Jonathan Wild, who rapidly replaced his previous master, Charles Hitchen, in 1713, and rapidly gained control of London's crime and the title of "thief-taker general". His power was due to his ruthless thief-taking and intimidation activities as well as a complex web of intelligence also built around the diffusion of newspapers. However, overly bold receiving was his undoing, as it grew so large and complex a matter to prompt the English government to promote further laws against receiving and related activities, such as the Transportation Act in 1718, also known as "Jonathan Wild Act", and its extension in 1720, which made returning goods for a fee a felony of the same importance and punishment as the crime (theft) related to the goods returned (which meant a capital offence in most cases, with raised potential reward for definitive evidence, from £40 to £140). Eventually, the government decided to directly take action against Wild through lawyers, succeeding in condemning and executing him in 1725. There is no registered case of female fences of the same fame of Wild or Hitchen. However, women had active roles in both receiving and theft. Elizabeth Hitchen, Hitchen's wife, gave her inheritance money to her husband in order to buy the Under City Marshal office for his plans. Moreover, women could also be active fences. For example, Elizabeth Fisher managed her own receiving business in her husband's alehouse. Proceedings stored in the Old Bailey Online archive where the offence category is receiving are 5664. Of these, 1858 have a defendant gender category of female. Receiving grew increasingly important in Early Modern society, and combined with the increasing interest of society on reading, it became the source for many writers, such as Daniel Defoe, with Moll Flanders and John Gay, with The Beggar's Opera. These works reflect how receiving was conceived and portrayed by authors. Moll Flanders is a novel intended to narrate the whole life of its protagonist, referred to as Moll Flanders, but a relevant part of it is about her becoming a master thief. Moll's activity as a thief largely relied on the protection and support of her governess, who acted also as a receiver for the goods stolen by her affiliates. She is the one who buys Moll's stolen goods the first time, as Moll narrates "I was now at a loss for a market for my goods,[...] At last I resolved to go to my old governess." Therefore, the governess character sealed Moll's fate as a thief, and eventually taught her the basics of thievery redirecting Moll to work with other senior thieves. With these events, Defoe shows how crucial as well as subtle receiving was in building the whole of crime activity in London. The Governess is officially a pawnbroker, and she uses this legal business to recycle stolen goods into the secondary market. Sometimes, such as in the case of a silver inscribed mug stolen by Moll, she smelts metals, in order to avoid getting caught while re-selling. Along with receiving activity, she actively protects and support many criminals and thieves in order to secure a steady income to her activity. The same governess goes on in protecting and offering refuge to her affiliates whenever possible, or recruiting thieves into small groups, always via middlemen, in order to protect their thieves' identities in case some of them were caught and willing to confess. She is also a main intelligence source and often a direct instigator to theft such as in a case of fire in a well-off house in the neighbourhood (more vulnerable to theft because of the sudden emergency), and finally becomes a broker for goods stolen by Moll to a drunken gentleman. In that case, the amount gained is allegedly greater than what she would have gained by standard re-selling in the secondary market. The Governess embodies female social cunning in London's underworld, from Defoe's point of view. She is a typical receiver of her time, and whereas many male receivers used thief-taking as an official business, she relies on pawnbroking. Under traditional Chinese law a fence, or receiver, (銷贓者), was a merchant who bought and sold stolen goods. Fences were part of the extensive network of accomplices in the criminal underground of Ming and Qing China. Their occupation entailed criminal activity, but as fences often had a non-criminal primary occupation, they acted as liaisons between the respectable community and the criminal underworld, living a “precarious existence on the fringes of respectable society”. Fences often worked alongside bandits in a network of criminal accomplices that was essential to ensuring both the safety and the success of fences. The path into the occupation of a fence stemmed, in a large degree, from necessity. As most fences came from the ranks of poorer people, they often took whatever work they could - both legal and illegal. In many circumstances, working as a fence was an option that was not too strenuous, but had the potential to bring in a fair sum of income. Most fences worked within their own town or village. For example, in some satellite areas of the capital, military troops lived within or close to the commoner population and they had the opportunity to hold illegal trades with commoners. At times, the robbers themselves filled the role of fences, selling to people they met on the road. :177 This may actually have been preferable for robbers, in certain circumstances, because they would not have to pay the fence a portion of the spoils. Butchers were also prime receivers for stolen animals because of the simple fact that owners could no longer recognize their livestock after the animal had been slaughtered. :175 Animals were very valuable commodities within Ming China, and a robber could potentially sustain a living from stealing livestock and selling them to butcher-fences. Although the vast majority of the time, fences worked with physical stolen property, fences who also worked as itinerant barbers also sold information as a good. Itinerant barbers often amassed important sources of information and news as they traveled, and sold significant pieces of information to those who offered money. :175 Often times, such information was sold to criminals in search of places to hide or individuals to rob. :175 In this way, itinerant barbers also served the role as a keeper of information that could be sold to both members of the criminal underground, as well as powerful clients. Fences not only sold items such as jewelry and clothing but was also occasionally involved in human trafficking hostages that banditires had kidnapped. Women and children were the easiest to sell and among the most common “objects” the fences sold. :156 Most of the female hostages were sold to fences and then sold as prostitutes, wives, or concubines. One example of human trafficking can be seen from Chen Akuei’s gang who abducted a servant girl and sold her to Lin Baimao, who in turn sold her as a wife for thirty pieces of silver. :156 In contrast to women who required beauty to sell for a high price, children were sold regardless of their physical appearance or family background. Young boys were often sold as servants or entertainers, while young girls were often sold as prostitutes. It was extremely important to their occupation that fences maintained a positive relationship with their customers, especially their richer gentry clients. When some members of the local elites joined the ranks of fences, they not only protected bandits to protect their own business interests, but they actively took down any potential threats to their illegal profiting, even government officials. In the Zhejiang Province, the local elites not only caused the dismissal of provincial commissioner, Zhu Wan, but also eventually “[drove] him to suicide”. It was also essential for them to maintain a relationship with bandits in order to protect their livelihood. However, it was just as true that bandits needed fences to make a living. As a result, fences often held dominance in their relationship with bandits. Taking advantage of their dominance in their relationships with bandits, fences also cheated bandits by manipulating the prices they paid bandits for stolen property. This was possible because fences often had an official and legal means of making a living, as well as illegal activities and could threaten to turn in bandits into the authorities. Aside from simply buying and selling stolen goods, fences often played additional roles in the criminal underground of early China. Inns and teahouses often became ideal places for banditries and gangs to gather in order to exchange information and plan for their next crime. Harborers, people who provided safe houses for criminals, often played the role of a fence as well, in receiving stolen goods from their harbored criminals to sell to other customers. Safe houses also included brothels and opium dens, as well as gambling parlors, and employees or owners of such institutions often functioned as harborers, as well as fences. These safe houses were located in places where there was a high floating population and people from a great variety of social backgrounds interacted. Brothels also helped bandits to hide and sell stolen goods because of the special Ming Law that exempted brothels from being held responsible “for the criminal actions of their clients.”  Although the government required brothel owners to report any suspicious activity, the lack of government enforcement as well as the motivation of owners to make an extra income from fencing led brothels to become an ideal safe house for bandits and gangs. Two different Ming Laws, the Da Ming Lü 大明律 and the Da Gao 大诰, drafted by the Hongwu Emperor Zhu Yuanzhang, sentenced fences to different penalties based on the category and value of the products that were stolen. In coastal regions, illegal trading with foreigners, as well as smuggling became a huge concern for the government during the mid to late Ming era. In order to prohibit this crime, the government passed a law in which illegal smugglers who traded with foreigners without the consent of the government, would be punished with exile to the border for military service. In areas where military troops were stationed, stealing and selling military property would result in a more severe punishment. In the Jiaqing time, a case was recorded of a robber stealing and selling military horses. The emperor himself gave orders that the thieves who had stolen the horses and the people who had helped to sell the horses would be put on a cangue and sent to labor in a border military camp. Fencing is illegal almost everywhere, usually under a similar rationale as in the United States, where receipt of stolen property is a crime in every state, as well as a federal crime if the property crossed a state line. Occasionally federal agents will temporarily set up a false fence sting operation. Fencing is a common source of income for organized crime. In England and Wales, as in many U.S. states, the crime requires three elements: stolen property, the receiver's act of receiving or hiding it, and his knowledge of its stolen status. Pawnbrokers have often been associated with fencing, though in many jurisdictions, government identification must be shown in order to pawn an item and police regularly check pawnshops for stolen goods and repossess any stolen items. While pawnbrokers do not like this characterization of their business, police efforts have indicated that some pawnbrokers are involved in fencing. Stores have complained that increasingly, shoplifters are stealing goods with the intent of selling them anonymously online. In this photo, a store loss-prevention officer scans the security cameras for shoplifters. E-fencing is the sale of items on the Internet that have been obtained illegally. It is an activity that criminals often mix with sales to pawnbrokers. The auction website eBay, being easy to reach for the average thief, is a popular location for e-fencing; customers reported more than eight thousand crimes from the website in 2008, many of which involved the sale of stolen property. Classified websites like Craigslist, AutoTrader.com, Pennysaver online, etc. are some of the Internet sources used for fencing goods online and circumventing the middleman fencer, in addition to a number of illegal darknet markets. E-fenced items may be shoplifted or otherwise stolen, alternatively they may be purchased using stolen credit cards or similar banking information. The latter practice is often intertwined with carding, which is the trafficking of thousands or even millions of stolen credit card numbers. The sale of stolen credit cards, which usually takes place on the darknet markets, is generally considered to be a form of e-fencing in its own right, and often plays a role in supplying the data used to purchase physical goods that may be either e-fenced themselves or fenced through more traditional means. Crime rings steal and/or use stolen financial information to pay for in-demand items from retailers and then sell them online, relying on the Internet's ability to reach buyers around the world and its anonymity; some theft rings even take pre-orders, confident that they can steal and/or fraudulently pay for whatever is currently in demand. In the United States, major retailers such as Wal-Mart and Target have advocated for federal legislation to combat Internet fencing. Proposals for such legislation have often proposed requiring major sales websites (e.g. eBay and Amazon.com) to retain some items' serial numbers and to release information to retailers about major sellers whom the retailers believe to be relying on stolen property. Such proposals have been opposed by the online retailers who would be required to maintain these records and take these actions. An eBay spokesman has stated, "Perhaps the dumbest place to try to fence stolen materials is on eBay," and news agencies have reported incidents of the police purchasing stolen property directly from thieves, leading to their capture. By early 2007, e-fencing had become a $37 billion business. ^ "''Online Etymology Dictionary''". Etymonline.com. Retrieved 2009-09-09. ^ a b Wilber, Del Quentin (August 16, 2004). "D.C. Cracks Down as Stolen-Goods Dealers Evolve: Fencing Becomes More Sophisticated, Disciplined". Washington Post. p. A01. Retrieved June 24, 2011. ^ a b c d e Steffensmeier, Darrell J. (1995). "Fencing Stolen Property". In Bailey, William G. (ed.). The Encyclopedia of Police Science. Taylor & Francis. pp. 291–296. ^ a b Beattie, , J. M. Crime and the Courts in England 1660 - 1800. Oxford: Clarendon, 1986, pp.159-60. ^ a b Beattie, J. M. Policing and Punishment in London, 1660-1750 Urban Crime and the Limits of Terror. Oxford: Oxford UP, 2001, p.39. ^ Beattie, J. M. Crime and the Courts in England 1660 - 1800. Oxford: Clarendon, 1986, pp.189-90. ^ Old Bailey Proceedings Online (www.oldbaileyonline.org, 22 November 2015), Searched Old Bailey Proceedings for all offences where offence category is receiving and verdict category is guilty. ^ Beattie, J. M. Crime and the Courts in England 1660 - 1800. Oxford: Clarendon, 1986, pp.41-48. ^ Beattie, J. M. Policing and Punishment in London, 1660-1750 Urban Crime and the Limits of Terror. Oxford: Oxford UP, 2001, p.250. ^ Beattie, J. M. Crime and the Courts in England 1660 - 1800. Oxford: Clarendon, 1986, pp.55-59. ^ Beattie, J. M. Policing and Punishment in London, 1660-1750 Urban Crime and the Limits of Terror. Oxford: Oxford UP, 2001, p.251. ^ Beattie, J. M. Policing and Punishment in London, 1660-1750 Urban Crime and the Limits of Terror. Oxford: Oxford UP, 2001, pp.253-254. ^ Beattie, J. M. Policing and Punishment in London, 1660-1750 Urban Crime and the Limits of Terror. Oxford: Oxford UP, 2001, p.232. ^ a b Beattie, J. M. Policing and Punishment in London, 1660-1750 Urban Crime and the Limits of Terror. Oxford: Oxford UP, 2001, p.381. ^ Hitchcock and Schoemaker. Tales from the Hanging Court. London: Hodder Arnold, 2007, p.20. ^ Kermode, and Walker. Women, Crime and the Courts in Early Modern England. Chapel Hill London: U of North Carolina, 1994, p.93. ^ Kermode, and Walker. Women, Crime and the Courts in Early Modern England. Chapel Hill London: U of North Carolina, 1994, p.92. ^ Old Bailey Proceedings Online (www.oldbaileyonline.org, 27 January 2018), Searched Old Bailey Proceedings for all offences where offence category is receiving and defendant gender is female. ^ a b The Fortunes and Misfortunes of the Famous Moll Flanders &c. on Project Gutenberg, accessed on November 23, 2015. ^ a b c d e f g h i j k l m n o Antony, Robert (2016). Unruly People: Crime, Community, and State in Late Imperial South China. Hong Kong: Hong Kong University. p. 174. ^ Robinson, David (2001). Bandits, Eunuchs and the Son of Heaven: Rebellion and the Economy of Violence in Mid-Ming China,. Honolulu: University of Hawai'i Press. p. 58. ISBN 978-0-8248-6154-4. ^ a b Robinson, David (2001). Bandits, Eunuchs and the Son of Heaven: Rebellion and the Economy of Violence in Mid-Ming China. Honolulu: University of Hawai'i Press. p. 58. ISBN 978-0-8248-6154-4. ^ Antony, Robert (2016). Unruly People: Crime, Community, and State in Late Imperial South China. Hong Kong: Hong Kong University Press. p. 172. ^ Robinson, David (2001). Banditry during the Mid-Ming Period: Bandits, Eunuchs and the Son of Heaven. Hawaii: University of Hawai'i Press. p. 49. ^ a b Yang, Yifan (2013). Ming dai li fa yan jiu. Zhongguo she hui ke xue yuan xue bu wei yuan zhuan ti wen ji = Zhongguoshehuikexueyuan xuebuweiyuan zhuanti wenji (Di 1 ban ed.). Beijing: Zhongguo she hui ke xue chu ban she. p. 326. ISBN 9787516127179. OCLC 898751378. ^ Warner, Bill. "No Questions Asked: Sarasota Pawn Shop Businesses Charged in Sting Operation, Black-Market Fencing Easy Cash For Burglars & Armed Robbers." April 25, 2011. http://www.zimbio.com/Crime,+Background+Checks,+Foul-Play,+Fraud+And+Investigations/articles/JFXTKyZc6TE/No+Questions+Asked+Sarasota+Pawn+Shop+Businesses Accessed on June 24, 2011. ^ Pierce, Tarik (2007-01-25). "Efencing Theft Problems on eBay". Investortrip.com. Retrieved 2009-09-09. Steffensmeier, Darrell J. The Fence: In the Shadow of Two Worlds. Rowman & Littlefield, 1986.